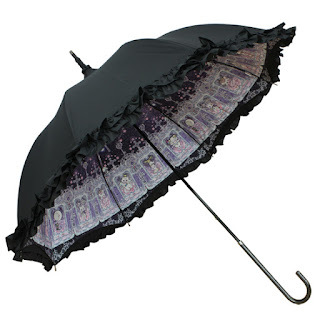 Tokyo Rebel: An all new shipment of Lumiebre umbrellas and parasols has arrived! An all new shipment of Lumiebre umbrellas and parasols has arrived! We've just received an all-new shipment of umbrellas from Lumiebre! We have brand new designs suitable for both sweet and Gothic styles, and we've received some restocks of old favorites too! We have so many new items we barely have enough room to display them all. Many of them have stunning prints on the inside- photos don't do them justice! Come visit us and check them out in person! Or shop our new arrivals or Lumiebre collection online! All of these items are available both in store and online now! Catch them before it's too late!